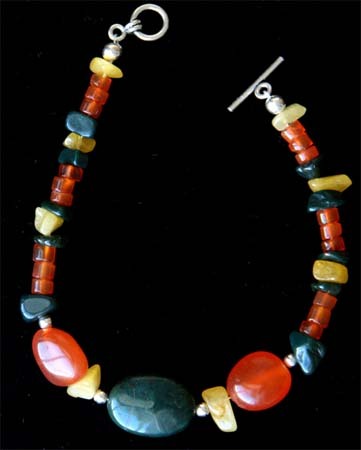 A powerful piece, this bracelet can help increase physical energy, fills the wearer with confidence and courage. Carnelian helps remind you of your unique strengths. Warms and cleanses the blood and kidneys, stimulates a healthy appetite. Brings abundance and aids in decision making. Yellow Calcite helps painful muscles and joints. Helps the spine, bones, pancreas and slpeen and the detoxification of kidneys and decalcification of joints and bones. Also clears personal negativity and makes you resistant to the hostile vibes of others (key to those stressful competitive moments). Heliotrope is associated with courage, abundance, purification and good fortune. It's a good stone for athletes and anyone else who wishes to win a competition. The bracelet is accented with sterling silver. The bracelet is made with a sterling silver clasp and comes in a gift box with a descriptive card. Women�s 7in. Women�s 7.5in. Men�s 8.75in.